A series of shots of the full moon on June 20, 2016, taken from Duluth, Minnesota's Park Point beach. The Superior Entry Lighthouse can be seen in the foreground. The photo was sent in by photographer Grant Johnson. June's full moon — known in some cultures as a "Strawberry Moon" — greeted night sky watchers yesterday (June 20), and coincidentally fell on the summer solstice, the longest day of the year. Space.com received a flood of gorgeous photographs of this celestial sight from readers all over the world. It was apparently a very popular event; even an astronaut on the space station couldn't resist taking a snapshot of Earth's neighbor. The composite photograph at the top of this article, captured by photographer Grant Johnson, shows how the color of the moon changes as it moves away from the horizon. 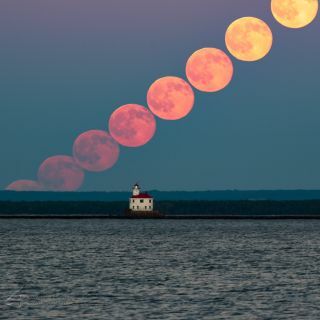 "I caught this stack of shots from tonight's solstice moonrise on Duluth, Minnesota's Park Point beach on Lake Superior," Johnson told Space.com in an email. "I zoomed in on the Superior Entry Lighthouse with a 250mm lens from about 2 miles [3.2 kilometers] away to get the Strawberry Moon to rise large above the lighthouse." The full moon on June 20, 2016, as seen from southern Pennsylvania by photographer Jeff Berkes. A full moon hasn't appeared on the summer solstice since 1948. The romantic juxtaposition of a bright, colorful moon and the beginning of summer was perhaps best captured in the photo above, taken by sky photographer Jeff Berkes (whose super-awesome photos have been featured on Space.com many times). The image, taken in southern Pennsylvania, uses focus stacking to get the interesting view of both the moon in the background and the flowers in the foreground, Berkes told Space.com in an email. He said that he doesn't typically use this technique, but "I thought it [might] come out pretty neat." The final image is two shots combined, and was snapped with a Nikon D4 with 200mm lens. A Strawberry Moon themed animation (above) even appeared on Google's front page as a Google Doodle. The full moon of June 20, 2016, had a colorful tint, created by light passing through Earth's atmosphere. The color is exaggerated in these images by photographer Nate Laurant. Light passing through Earth's atmosphere can make the moon look as if it has a colorful tint. This effect is especially visible during a lunar eclipse. The above photos, taken by Nate Laurant, exaggerate the colored tint of Monday's full moon. The details of the moon's surface are crisp and clear in this image taken on June 20, 2016, from Sulmona, Abruzzo, Italy, during a full moon. The above image may not be colorful, but the level of detail captured by sky photographer Giuseppe Petricca is absolutely breathtaking. Petricca, who lives in Italy, told Space.com the image is a mosaic composed of 30 panels. The images were taken using a SkyWatcher Black Diamond Newton 200/1000 telescope. The full moon, photographed on June 20, 2016, from the International Space Station by astronaut Jeff Williams. According to Williams, the shot was taken while the station was flying over western China. Astronaut Jeff Williams took the above image of the full moon from the International Space Station, "just before sunset while flying over western China," according to his post on Facebook. Summer has just begun, and it's already a cosmic season. Check out our suggestions for how to bring even more space into your summer season.